Just what does DVD Rebuilder do and why would I want to use it? I can't make DVD Rebuilder work properly. What can I do? How much do I have to know about all this to make this thing work? If I browse through the options I see a lot of things like quality_prec, deinterlacing, and decombing thingies. Do I need to use EclCCE.exe with DVD-RB? That brings up another point. If I use it, how? I set everything up -- but nothing seems to happen and/or I get video that is a black screen with orange/red lines at the bottom. There are other tools out there that allow me to remove streams, extras, audio, and other parts of a DVD. Can I run these on the source before using DVD-RB to make the final build? What in the name of heaven is an AudioDub(BlankClip())? Now you did it, you lost me. What is an AVS and why do you have to talk about it? Ok. Now that you're on the subject of "stuff" -- what does DGDecode.dll (MPEG2DEC3DG.DLL) do? And what's the difference between DGDecode.dll and MPEG2DEC3DG.DLL? I got an error code '75' -- what's up with that? What are all these files in the D2VAVS folder? Trying CCE SP 2.70 with DVD-RB when CCE launches during the encode stage, it sits waiting for me to press "encode" on the CCE window. How can I solve this? Why are subtitles missing from my backup? How can I contribute without a PayPal account? My original DVD is only 3.38 GB but after DVD-RB it's 4.32 GB, does that mean it's better than the original? Does DVD-RB remove the "layer break"? Is it possible to pause DVD Rebuilder and save the project and then load it back up again later to continue re-encoding? Is it possible to continue after computer crash? Can I use more recent versions of AviSynth, DGDecode etc ? When I save a project batch job, does it have to be within the folder of the DVD your backing up? I've checked the "Run Encoder(s) Minimized" but CCE still pops up a window? I can't select anything but 2 passes in the advanced options, why? I'm using Procoder 2 and after it finishes a segment it gives this "star wars" sound. Is there a way to turn it off? I removed some audio and subtitles in DVD-RB but I can still flip through them on my remote, why aren't they removed? Please note. On the content of these (help) pages you'll find some information that I, personally, found very "dangerous" if you don't use it wisely. When I say "dangerous" I'm not saying that it will harm your computer but I'm referring to the bad results, you may obtain, if you simply don't know what you are doing (this is a warning that you'll see a lot along the pages) and you may even make the program not to work at all. On the "Golden Rules" you'll find two that illustrates what I'm saying here: «If it says "Advanced" and you are not in that category -- don't change it.» and «Unless you know the impact of your setting, leave it at the default value. Most errors are "Self Inflicted".»... please keep these rules in your mind before using any of the advanced techniques or information. Over the course of the past couple of years DVD ripping techniques have changed dramatically. Newer "one click" programs have made backing up a DVD a fairly simple process... but there is a significant trade-off. The quality that can be attained by even the best of these programs is poor in comparison to original techniques that used Cinemacraft Encoder, TMPGEnc, or other top-notch encoders. The reason is simple. When using one of these encoders the picture is rebuilt from scratch and optimized for the resulting bit rate. One-touch transcoders usually change quantization and/or motion info in order to lower the bit rate. This can result in pixelation and poor overall picture. But, man, they sure are convenient. Have you used the Self Install Package (Installer)? If you didn't, try to use it. The manual setup, as described on the Installation section, may be confuse if you are a beginner. The Installer will make the process quite easy. How much do I have to know about all this to make this thing work? If I browse through the options I see a lot of things like quality_prec, deinterlacing, and decombing thingees. Nothing. Those are all there for advanced "geek" users. After the initial setup, where you have to point to a few things (if you didn't used the Installer) - you can just leave everything at the default and you should be fine. If you have a newer version of CCE that you have purchased, you don't need to use EclCCE. But if using CCE v2.50 (which is very popular) or any trial version (except 2.70 or superior), yes, you must use EclCCE. Version 2.50 and trial versions do not support command line parameter passing and/or saving/loading of .ECL (CCE Project) files. If you use the Installer, all the steps are done automatically. First install the EclCCE.exe file in the same directory as CCE (usually it is found under "C:\Program Files\Custom Technology..." (it changes by version after that). Then run the EclCCE.exe alone. The first time it runs it will require that you "point" it to your CCE executable. You have to do this! Failure to do so makes it not work and make you angry. After that is completed -- and this is important -- point the CCE path located in DVD-RB's Setup dialog to EclCCE.exe, NOT the CCE executable. If you use the Installer, all the steps are done automatically. You (probably) are having a problem with the location of DGDecode.dll (or MPEG2DEC3DG.DLL - if you are using this old Decoder). 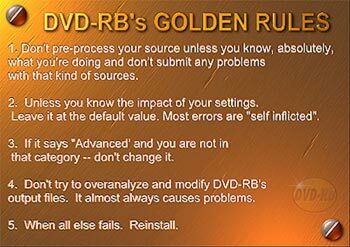 Make sure you are using the correct version (DGDecode.dll v1.1.0 - you can download it on the "Downloads - Decoder" section on www.dvd-rb.com), that you have it on your DVD Rebuilder's root folder and verify the path to it on the Setup window. If you have it on your AviSynth's Plugins folder it should work. But some 3rd party software designers (bless their hearts) have decided to change the AVISYNTH registry entry to another location that's why it is better if you just put it on Rebuilder's folder. If you use the Installer, all the steps are done automatically. Yes, I would never want to stifle creativity. But do so at your own risk. Some (well... most) of these programs "butcher" the source without taking every aspect of the DVD into consideration. A butchered source can confuse DVD-RB (or any other program downstream) and cause it to do strange things... Any DVD-RB bug reports you decide to post should only apply to non-butchered sources. Please... read Golden Rule Nº1. That's a fair question. For those who have been around awhile there is a known bug with CCE 2.50 in which it, when used with an AMD (Athlon?) processor, can die a terrible death when confronted with an AVS files/stream that doesn't contain audio. By inserting this line, a blank audio clip is inserted and everything works. Some later versions have also been reported to have memory leaks that go away if this is inserted. This line would is inserted by default in every AVS file to fix these issues. Some folks, however, have reported that their encodes seem to get slower when this is inserted (although I must say it has never happened to me), so this option allows them to remove it if they believe it isn't necessary. DVD Rebuilder stands on the shoulders of some very powerful and inventive freeware and donate-ware software packages. One of them is AVISYNTH. AVISYNTH is a scripted video processor that, quite frankly, is just incredible. It can take input video files, modify them in innumerable ways, and present them to players or encoders. But you don't have to know how to use it in order to take advantage of DVD Rebuilder. All the scripts are created by DVD Rebuilder and you, the user, are kept insulated from its complexities. An AVS file is the input command structure (actually just a text file) that instructs AVISYNTH how and when to process input video. if you want to get smart on AVISYNTH look at the enormous amount of information in the AVISYNTH section of the Doom9 Forum. Good question. (Isn't it amazing that I can write a question to myself, and then complement myself on it?) AVISYNTH has many options -- including a software development kit, standard interfaces, and a way to create "plugins" so its capabilities can be extended. MPEG2DEC3DG.DLL is a plugin that allows AVISYNTH to read DVD .VOB (Video Object) files and move back-and-forth through them (just as if they were a simple video file). It does that through a .D2V file which stores important information about the type and location of frames within the .VOB file. The D2V format and function was created by a program called DVD2AVI -- another incredible piece of software. While DVD-RB doesn't require DVD2AVI.EXE to run (it does it's own file parsing and .D2V creation) -- my hat is off to genius represented in this product. DVD2AVI also has its own dedicated section in the Doom9 Forum. They're quite the same or at least the function is the same. DGDecode.dll is a newer, more accurate, and faster version of MPEG3DEC3DG.DLL. Be sure that you are using the correct version (DGDecode 1.1.0). If you have any doubts, just use the Installer or download it from HERE. You have mounted the source DVD on a virtual drive and are using an old version of DVD-RB. Upgrade. The Freeware release is... Free. Contains info about the project settings, it's progress and properties for each cell. Each VTS to be re-encoded gets a .d2v. These files are like a map of the original video files (VOBs), it tells AviSynth how to decode it. Each cell gets a .flg file. These files contain flags from the original video file, on rebuild they are applied to the new video to recreate the exact video structure. Each cell gets a .avs file. These files tell AviSynth how to stream the video from each cell to CCE. The .avs file does several things. It decodes the video from the original .VOB, cuts out just the cell segment we are interested in, performs any special steps (deinterlace, resize, custom filters), converts it to a format CCE will accept, and adds a fake audio track to work around a CCE bug (if needed). Contains CCE instructions (jobs) for encoding all the video cells. The CCE job for the current cell to be encoded is copied into this file. It is then loaded into CCE and the encoding begins. During the first pass CCE creates this file which contains information about the video it gathers during the first pass. After the first pass the reencoded video is output to this file. During rebuild DVD-RB looks at the rebuilder.inf and then takes the reencoded video (.m2v), applies the flags (.flg), and muxes it with the selected audio and subtitle tracks from the original source. Trying CCE-SP 2.70 with DVD-RB when CCE launches during the encode stage, it sits waiting for me to press "encode" on the CCE window. Open the Setup dialog (under menu "Options") and check the "Run Encoder(s) Minimized". A1: DVD-Rebuilder doesn't support Closed Captions (for the deaf and hard of hearing) yet so they will be missing from your backup. In general, nope. You reencoded it which means it has lost some quality. If you have a noisy source there are instances where reencoding will give a result that is subjectively better than the original. Or if you apply the right filters to it. DVD-RB is more conservative in removing the "layer break" than some other popular programs out there. The problem is that there really is no such thing as a "layer break" except at the physical layer on the DVD. What most people think of as a layer break is the System Clock Reference (SCR) discontinuity that is set at the time the layer break happens. Unfortunately there are lots of other good reasons to have an SCR discontinuity. DVD-RB looks at the discontinuities, considers them, and if it is obviously related to a layer break -- it removes it. If there is any doubt, however, it remains. Yes. In order to resume, you must have "one click mode" disabled or it will start from the beginning. Press encode and DVD-RB will ask if you want to resume the project. Can I use more recent versions of AviSynth, DGDecode etc? The versions included with the installer are the recommended and supported versions. You can try other versions, if it works it works. Don't blame DVD-RB if it doesn't. You can save any project file anywhere you want. That option works for most encoders, but it doesn't work for some versions of CCE. CCE Basic, QuEnc and HC Encoder don't support more than 2 passes. Launch Procoder, from the Options menu select Application Settings. Check "Disable Sound on 'conversion finished'". The actual audio and subtitle are removed, but the reference for them aren't. If the reference is removed the menu on the DVD might not work as it should.